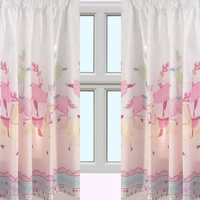 Children’s curtains have become popular for a reason as parents endeavor to do all they can to offer their kids an environment to live in that would help them develop a positive mentality towards life as they grow. 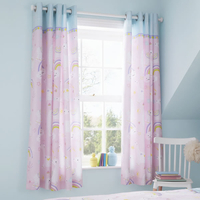 There are several accessories and products available in the market for parents wanting to decorate their children’s bedrooms and children’s curtains happen to be one of them. 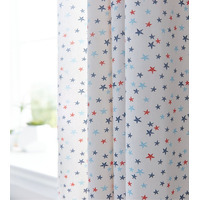 Featuring an all over print of blue and red stars against a white background. 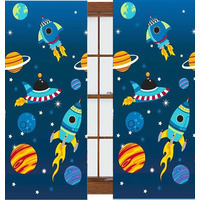 Glow in the dark, space themed curtains with blasting rockets and exploring astronauts, surrounded by different planets and bright, colourful stars against a dark blue background. Stunning, silver jacquard curtains with eyelet headers and silver thread running through the pattern which glitters when it catches the light. Stunning mermaids in shades of pastel pink and purple floating and dancing around on a pale pink background. 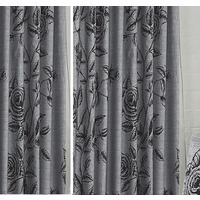 High quality, lined curtains. Cute woodland creatures design on a duck egg blue background interspersed with flowers. You can see hedgehogs, bears and badgers all having a fun time. 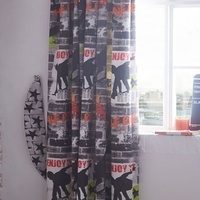 In neutral colours of grey and black with a distressed feel, these kids bedroom curtains have footie related wording all over. 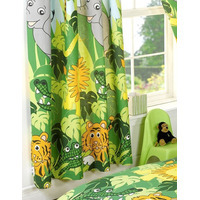 Let your kids go on a safari adventure with these colourful curtains. There are lots of animals including zebras, lions, tigers and giraffes, amongst many others, all strolling over a white background. 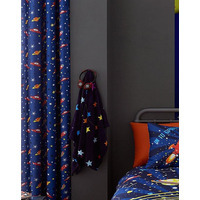 Have them dreaming of faraway galaxies with the Happy Space bedroom curtains. 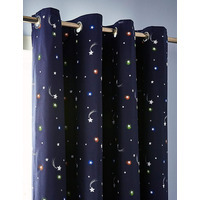 With an easy to hang eyelet header, the shooting stars and glowing planets are scattered across a midnight blue backdrop. Fully lined for a luxurious feel. An illustrative design on a pretty pink background featuring a smattering of glitter and an adorable llama-corn fitted with an easy to hang eyelet header and fully lined to ensure a restful nights sleep. 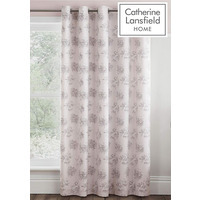 Catherine Lansfield is renowned for style and quality - an everyday essential for those who love great home fashion. Prima ballerinas need a calming space to rest their dancing feet! 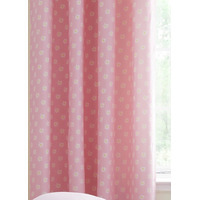 These curtains feature a repeated pattern of pretty painted ballerinas, dance on a pale pink background. Matching duvet set and fitted sheet will complete the graceful look. 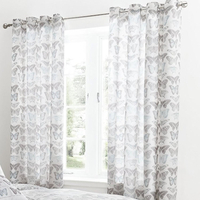 A land of magical butterflies is just a dream away with this pair of curtains. 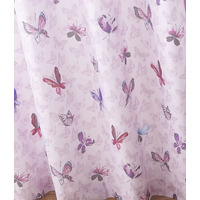 Featuring delicate fluttering butterflies in pastel shades of pink and purple, on a crisp white background. 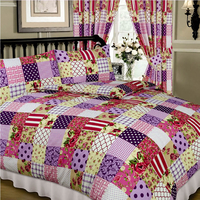 Pair with the butterfly duvet set and fitted sheet to complete the look. 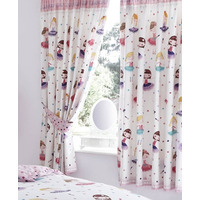 Send her to sleep dreaming of a faraway fairy kingdom with these pretty curtains. 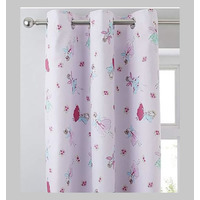 Delicate fairies and beautiful pink flowers are dotted around on the pale pink background. 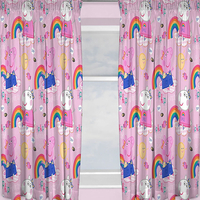 Bring a touch of magic to your little ones room with the enchanting folk unicorn curtains. A delightful pattern of pink unicorns, flowers and leaves, cover the fresh white background. 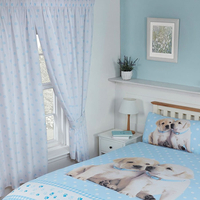 Complete the magical space with the matching duvet set and fitted sheet. Catherine Lansfield is renowned for style and quality. A contemporary, Great British Design. Feel like youre in the stadium with the football collection, with printed footballs in neon pink, its perfect for any footy mad child. 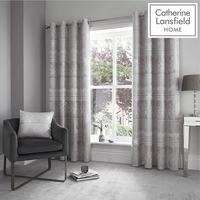 Catherine Lansfield is renowned for style and design, a contemporary Great British design. Feel like youre in the stadium with the football collection, with printed footballs in neon yellow, its perfect for any footy mad child. Catherine Lansfield is renowned for style and design, a contemporary Great British design. Featuring an all over print of red rockets and UFOs, orange planets and shooting stars against a blue background. 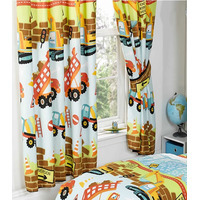 Your little one will be racing off to bed with the super fun transport curtains! 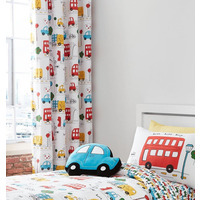 The curtains are filled with brightly coloured cars, buses, bikes and trucks, printed onto a fresh white background. Pair together with the transport duvet set and fitted sheet for the perfect motor-mad bedroom. Perfect for a teenagers bedroom this design mixes computerised pixel images with Gothic skulls. There is row upon row of a pixelated headphone wearing skull, the tiebacks have a contrasting pixel effect. Retro Cassettes takes us back to the good old days of the tape tape recorder, of mix tapes, dance hit favourites and personalised collections all in brightly coloured tones on a crisp white background, the tiebacks have a contrasting, colourful stripe design. 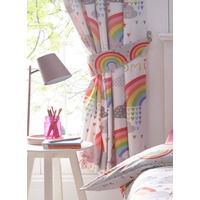 Vibrant and colourful bedroom curtains with rainbows and fluffy clouds with stars, love hearts and wording, the tiebacks have contrasting images of rainbows. A rich cream background with images all over of the most famous steam engine in history, The Flying Scotsman. You can see the puffs of steam coming from the engine and the train is placed at different angles on the panels. 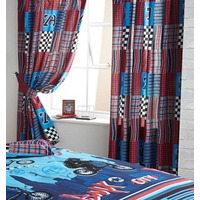 Cool and funky bedroom curtains with images of skateboarders pulling their tricks with the relevant wording for them - such as kick flip, pipe and 360. The background is a dark grey brick effect and there are splashes of colour with orange, red and green here and there. On a pastel blue background there are different coloured unicorns, fairies, flowers, toadstools, butterflies and horseshoes. The words Happy fairies and Magical Unicorns are dotted around. The tiebacks are pink with rainbows and clouds. Catherine Lansfield is renowned for luxury and comfort. A contemporary Great British design. 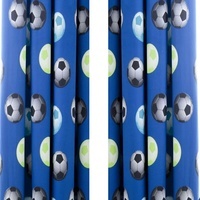 Give your child’s bedroom a fresh footy transformation with these cool curtains. The curtains, covered with printed footballs, will pair perfectly with the matching duvet sets, wall art and throw, available in red and blue – now they just have to decide which team they are on! Trucks, Diggers and Tractors adorn the curtains working on the roads, with road signs, traffic lights and traffic cones. The bottom is blue with yellow arrows and blue squares. The tie backs are blue with blue arrows. A rich cream background is host to Thelwells famous cartoon ponies in various stages of competitions. They can be seen trotting, jumping the posts and throwing their riders! A fun, illustrated design. 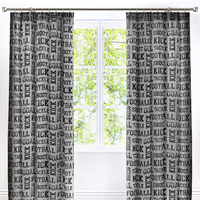 Fully lined, pencil pleat curtains featuring black and white footballs being kicked into the net, along with slogans on a background of black and grey squares. The colourful trains are hard at work chugging through the countryside with their carts full of heavy goods and timber, passing fields of apple trees and sheep. The tie backs are blue with train related signs. Featuring magical unicorns patterned with polka dots, stars and triangles in shades of pink and purple, galloping among clouds and stars. The tiebacks are pink with an all over print of pink, purple and white stars. 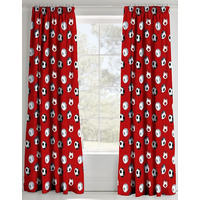 Fully lined curtains with eyelet headers featuring bouquets of flowers in shades of purple, red and orange against a pale blue background. 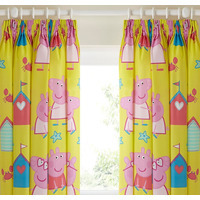 These are truly delightful nursery curtains for an imaginative toddler. Help your little one choose names for all the woodland animals that are scampering and playing under the trees among the colourful flowers, ferns and toadstools. Bold blocks of colour with a simple soft texture. Genuine Catherine Lansfield Product. 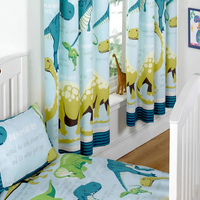 Prehistoric themed curtains with colourful dinosaurs against a light blue background, surrounded by bones, footprints and plants. 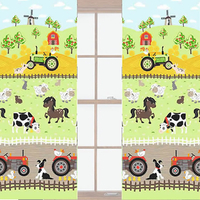 Childrens, themed bedroom curtains with a farmyard design.A bright and colourful depiction of life on a busy, working farm with all the animals present including the ducks, cows and sheep. There are tractors and a barn too! 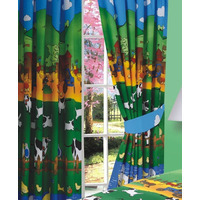 These vibrant kids curtains are in a 72" drop with a farmyard design. The cows, ducks and hens are all enjoying the lovely sunny day. The sheep dog is busy herding the sheep, while the farmer is busy in the apple orchard on his yellow and red tractor. Made from an easy care polyester fabric they are lined and include tie backs. Patchwork style squares with lace effect hearts in varying colours and shades of pink, red and purple, the matching tie backs are of the same pattern. 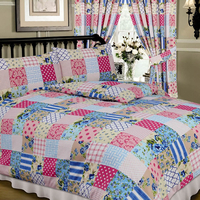 Patchwork is having a resurgence with the popularity of everything crafty and home-made, so these pink, blue and cream patchwork curtains will surely be hit. Theres stripes, spots, flowers, geometric and cross stitch patterns all in the mix. 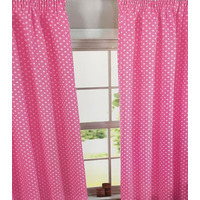 Pencil pleat curtains with tie backs featuring pink polka dots against a white background. 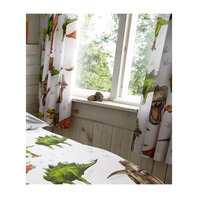 Boys bedroom curtains featuring a whole herd of dinosaurs. With an Apatosaurus, a Raptorex, a T-Rex, a Triceratops and a Stegosaurus in a rotary style pattern. These will be both decorative and informative both at the same time as each dinosaur has a set of facts written next to it. Blue curtains. They are awash with images of all the different planets and stars - Jupiter, Mars, Venus, Earth, Pluto, The Moon, The Sun, Uranus, Neptune and Mercury. It also has comets, Orion, Supernova, Rockets flying about, meteors. Each planet has a description about them. The tie-backs are a lighter blue with different shaped white stars dotted about. Featuring a peg legged pirate and a young pirate sailing their ships, across the seas in search for treasure chests. The blue background is printed with compasses, maps and treasure. This is truly a delightful theme for an imaginative toddler. Help your little one choose names for all the woodland animals that are scampering and playing under the trees among the colourful flowers, ferns and toadstools. Trucks, Diggers and Tractors adorn the curtains working on the roads, with road signs, traffic lights and traffic cones. The tie backs are blue with blue arrows. 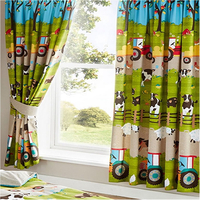 These vibrant kids curtains are in a 54" drop with a farmyard design. The cows, ducks and hens are all enjoying the lovely sunny day. The sheep dog is busy herding the sheep, while the farmer is busy in the apple orchard on his yellow and red tractor. Made from an easy care polyester fabric they are fully lined and include tie backs. 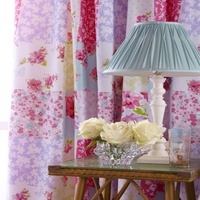 Glamping holiday themed curtains in pretty, pastel colours. Blue, pink, purple and yellow caravans, cars, ice cream vans and tents are printed on a white background, surrounded by flowers and bunting. The matching tie backs feature a pale blue, pink and white check design. 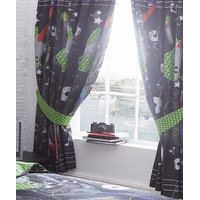 Rock music themed curtains featuring colourful guitars, headphones, speakers and CDs. The black background is printed with music notes, stars and skulls. The tiebacks feature a light and dark green pattern. 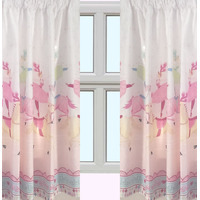 Girls charming white, fully lined curtains with a gymkhana and show horse design. The grey and tan horses and riders are competing for their rosettes against a background patterned with stars, fences, awards, flowers and topiary bushes. The tie backs are a deep pink with a white daisy type pattern. White and blue polka dot bedroom curtains with tie backs and pencil pleat headings. 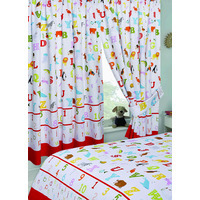 Brightly coloured, vibrant curtains featuring the Alphabet in upper case with a relevant animal next to it. There are numbers 1 to 10 near the bottom and the alphabet again in lower case beneath this, finished off with a band of bright red. 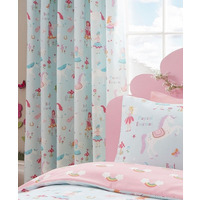 Ballerina, girls curtains with contrasting tie backs in pretty pastel colours and lined. 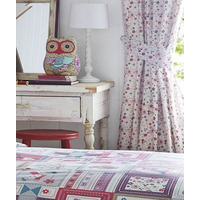 Kids, Owl themed bedroom curtains in a 72 inch drop from the Owl and Friends range. 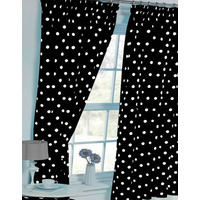 Monochrome, black and white polka dot curtains with pencil pleat headings. 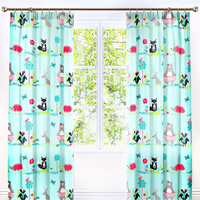 Fully lined, pencil pleat curtains featuring rabbits and ducks in the park on a light grey background. Some are wearing raincoats and wellies whilst jumping in the puddles, some are playing hopscotch and others are riding their bikes and scooters. 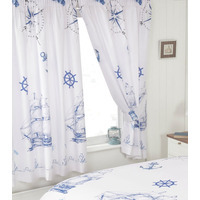 Nautical themed curtains featuring images of blue sailing ships, compasses, anchors and ship wheels on a white background with a border of ropes and anchors at the bottom. 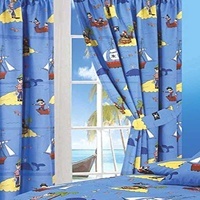 To match our best selling boys single and toddler duvet sets a pair of navy blue, fully lined curtains. Kids, fun bedroom curtains from our range of Under Construction featuring daily life on a building site. 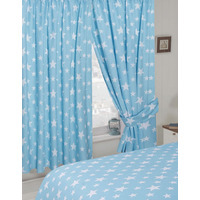 Bedroom curtains in a duck egg blue with white stars in differing sizes all over. 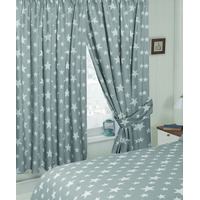 Bedroom curtains in a pale grey with white stars in differing sizes all over. 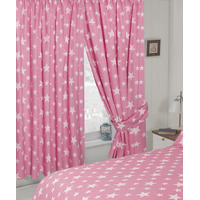 Bedroom curtains in a pale pink with white stars in differing sizes all over. Are your childrens bedroom curtains too thin and letting in the early morning light, which leads to the kids waking up waaaay too early?. The blue background represents the sea with the occasional fish swimming along trying to avoid the anchors, lifebuoys and various tugs, yachts and sailing boats. Wild black roses are all over a charcoal grey background which has a thatch linen, crisscross effect. Perfect for any room in the house. 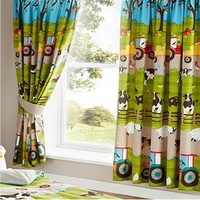 Childrens, themed bedroom curtains with a farmyard design. A bright and colourful depiction of life on a busy, working farm with all the animals present including the ducks, cows and sheep. There are tractors and a barn too! The prettiest troupe of ballerinas are pirouetting and ballet dancing across the white background in their fluffy, pastel coloured tutus. The multicoloured polka dot background is complemented by the pale pink, patterned border. Bright and colourful kids patchwork style with a multitude of patterns with flowers, spots and criss cross squares all in rich summer berry colours. On a pastel blue background there are different coloured unicorns, fairies, flowers, toadstools, butterflies and horseshoes. The words Happy fairies and Magical Unicorns are dotted around. The tie backs are pink with rainbows and clouds. Pretty floral eyelet curtains with a composition of delicate blush pink and dove grey floral posies on a blush background. 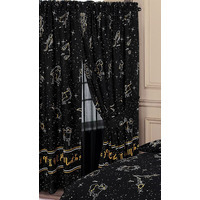 You will literally be seeing stars with these constellation curtains in black with twinkling stars and all the signs of the Zodiac dotted over. There is a band across the bottom with all the star signs in orange. 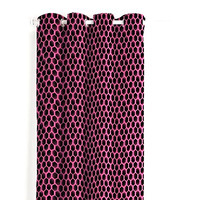 Fully lined, pencil pleat curtains with a white polka dot print against a dark pink background. Pale Blue, kids curtains which featuring a whole load of dinosaurs. With an Apatosaurus, a Raptorex, a T-Rex, a Triceratops and a Stegosaurus in a rotary style pattern. Flying fairies on a sky blue background with fluffy white clouds above floral castles in gorgeous colours and pretty green grass and cute little flowers. Edged with a contrasting cerise pink border. 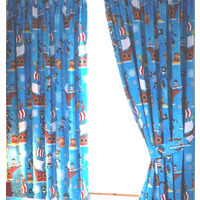 Boys, blue bedroom curtains with a pencil pleat heading. Head shots of Fireman Sam with white always on duty and Fireman Sam To The Rescue lettering. 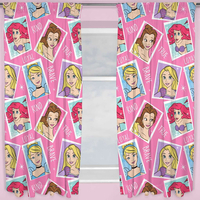 Girls lined bedroom curtains, with tie backs in a 72" drop. Pale pink with a small, white polka dot pattern. Fully lined curtains with eyelet headers. The cheeky monkey is making sure his banana is safe, although the giraffe, with his long neck, or the elephant with her stretchy trunk might try to pinch it! 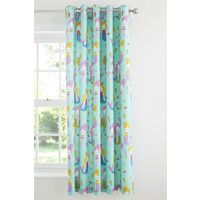 Brightly coloured, vibrant curtains featuring the Alphabet in upper case with a relevant animal next to it. There are numbers 1 to 10 near the bottom and the alphabet again in lower case beneath this, finished off with a band of bright red. These would make fun nursery curtains and could also help with early learning. Join the My Little Pony adventure! Fluttershy, Pinkie Pie, Rarity, Twilight Sparkle and Rainbow Dash are jumping across a purple background, patterned with twinkling stars. Peppa and one of her best friends, Suzie Sheep are clapping and smiling whilst sitting on gingham patterned clouds against a pink background, decorated with bees, birds and rainbows. Roaring dinosaurs are all over a crisp, white background, There are Brachiosaurus, Velociraptor and Stegosaurus to name just a few and you can also see grey footprints running in between them. 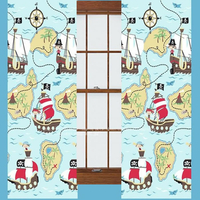 Pirate themed bedroom curtains with a blue background depicting the briny sea with several islands dotted around - which one is treasure island? 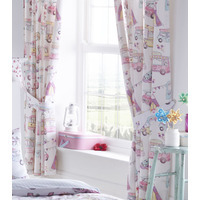 Stunning, girls bedroom curtains with images of pretty unicorns dancing around fluffy clouds and rainbows. Each has words across them such as Magical, Unicorn and Good Night. The background is pale blue and there is a cerise dotted band across the top. The two sisters, Anna and Elsa are against a purple background surrounded by pretty patterns of snowflakes, stars and sparkles in shades of blue, purple and white. Football crazy design featuring lots of blue, black and white footballs on a green football pitch themed background with a blue border running across the top and bottom of the curtains and the word Football running across. Football crazy design featuring lots of red, black and white footballs on a green football pitch themed background with a red border running across the top and bottom of the curtains and the word Football running across. 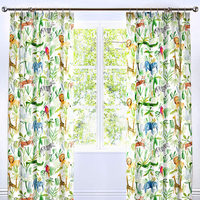 Each curtain panel is decorated with friendly jungle animals including smiling lions swinging monkeys and snapping crocs. With large, lumbering grey elephants and tall yellow giraffes keeping a beady eye on everyone, especially the slithery snake. A geometric Scandinavian inspired design in cool tones of grey, blue and yellow. A genuine Catherine Lansfield Product. 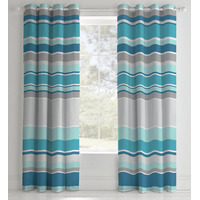 Fully lined curtains with tab top headers featuring vertical stripes in different shades of blue. The on trend print will add a modern touch to any room. 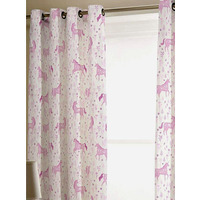 Girls lined bedroom curtains, with tie backs in a 54" drop. Pale pink with a small, white polka dot pattern. With images of all the animals including grazing cows, springing lambs, dancing horses and grunting pigs all in their normal habitat going about their daily business and rituals. There is a mother duck being followed by her cute little chicks all the while the sheepdog watching their every move and making sure they stay safe. 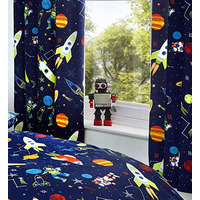 Boys, Space and Rocket, fully lined curtains with tie backs. 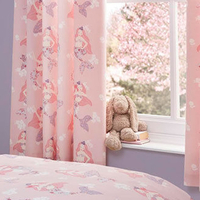 The beautiful pastel shades of fluttering butterflies and stunning flowers make these curtains a must have for any girls bedroom with the pinks, lilacs and green. Please note there are no tie backs included with these curtains. 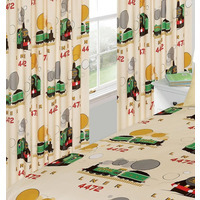 Transport themed boys curtains showing rows of red and green family cars, blue pick-up trucks and yellow tartan school buses, interspersed with a variety of road traffic signs. 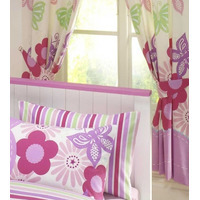 Girls white bedroom curtains with a colourful butterfly design. Rows of pink, blue, orange, yellow and red butterflies flutter among a pattern of pastel cololured petals and flowers. These pencil pleat curtains are available in two sizes and we have matching and in stock, along with a matching light shade and wall canvas. 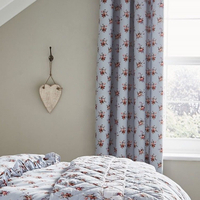 Patchwork bedroom accessories are increasing in popularity and looking at these floral, summery curtains, it is easy to see why. An assortment of different flowers and petals in shades of blue, pink, green, white and lilac. 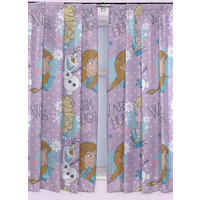 Pencil pleat curtains with the Princesses - Ariel, Belle, Cinderella and Rapunzel are posing in pastel coloured panels against a pink background. 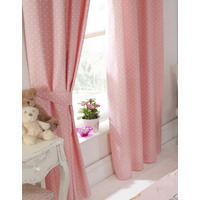 Girls bedroom curtains with a pale pink background covered with pretty flowers, dots and love hearts and little girls dressed up as fairies, princesses, line dancers and little red riding hood. The tie backs are a contrasting blue with pink love hearts. Rows of googly eyed owls. Tall, short squat owls with pink and purple patterned bodies sitting on long tree branches. 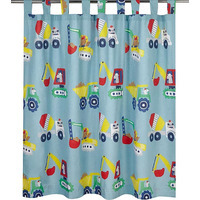 Kids bedroom curtains filled with funny little workmen busily going about their day in diggers, cement mixers and tip trucks. 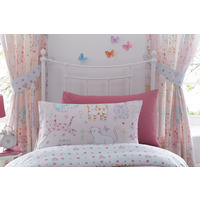 A colourful addition to a childs bedroom. Featuring Hulk, Iron Man, Thor and Captain America in a repeated, colourful pattern, with the Avengers logo on a grey background. The top of the curtain has a pale blue sky with pink fairy carriages, across the middle are gorgeous unicorns with their pink manes and tails swishing as they canter through the woods, underneath these are the girls, the beautiful princesses, one blonde, one brunette. Both are dressed in their finest gowns with their sparkling tiaras in their hair and at the bottom of the panel is a pale pink band with deeper pink spots. 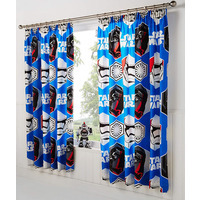 Boys blue curtains from the Star Wars, Awaken series. Two distinct rows featuring alternate six sided shapes with the Storm Troopers and Kylo Ren being the main characters, along with large white STAR WARS lettering. 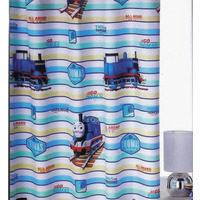 A lovely distinctive pattern to compliment your Thomas the Tank Engine bedroom. A series of pale blue and lemon, horizontal stripes, bordered with a dark blue band is the background to our adventurous little train engine. Intermingled with these images are associated plaques and red and blue lettering GO THOMAS and ALL ABOARD. With a natural / pale cream with a faded striped background these lined curtains have eyelet tops and are perfect to use on a pole. They are covered with butterflies of all different species and are coloured in shades of duck egg blue and pale grey. Aaarh me matey! 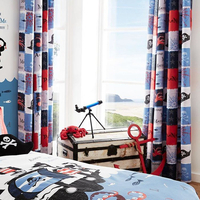 Patchwork style curtains, featuring pirate related images, including pirate hats, skulls and crossbones and compasses along with squares of fish. 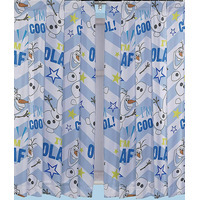 Olaf, the shining star of Disneys Frozen has his own range, including these lovely curtains. Flying fairies on a sky blue background with fluffy white clouds above floral castles in gorgeous colours and pretty green grass and cute little flowers. Edged with a contrasting cerise pink border. These girls curtains are fully lined and include matching tie backs. Featuring cute and colourful foxes, owls and rabbits against an off white background, decorated with acorns, leaves and toadstools. 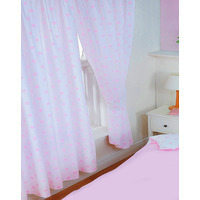 Pink bedroom curtains from our exclusive range Love to Dance. We all love to dance, especially these cute little ballerinas. 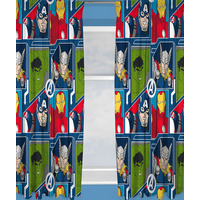 Featuring Hulk, Iron Man, Thor and Captain America in a repeated, colourful pattern, with the Avengers logo on a dark blue background. 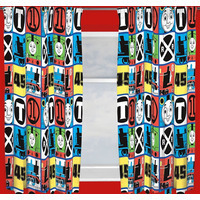 Brightly coloured Thomas curtains featuring the trusted little engine and some of his friends in both side and front on images. There are also logos and railway signs all in blue edged squares all over. 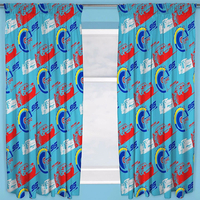 Pencil pleat curtains with red images of Lightning McQueen and pale grey images of Jackson Storm racing against a blue background, printed with blue and yellow speedometers. Featuring cute and colourful foxes, owls and rabbits on an off white background, decorated with acorns, leaves and toadstools. 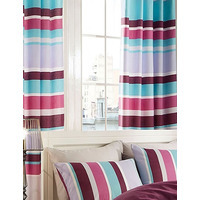 Fully lined curtains with eyelet headers featuring horizontal stripes in different shades of purple and teal. 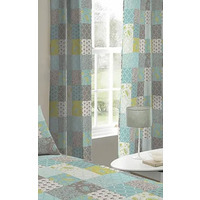 The on trend, bright and bold design will add a modern touch to any room. 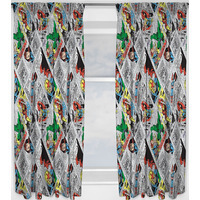 Fully lined, pencil pleat curtains with a bold and bright, blue comic book style pattern against a black background. Each of these panels is decorated with brightly coloured and highly decorated bunting, row upon row of vibrant Asian carnival inspired flags. 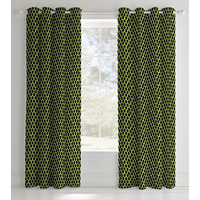 Fully lined, eyelet curtains featuring a green camouflage print with white slogans such as Keep Out! and No Adults Allowed. 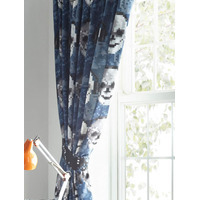 Floral themed curtains featuring an all over print of flowers and leaves in different sizes and styles in shades of blue, green, pink and purple against a cream background. Welcome to the circus big top, where the arena is filled with pretty pink show horses and their tutu clad, ballerina trainers. 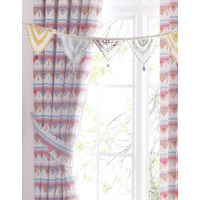 A very attractive set of girls curtains with a pink and blue harlequin designed border. 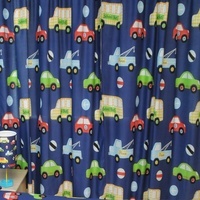 Boys bedroom curtains with an Emergency Vehicle theme. 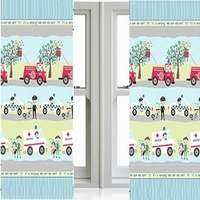 Blue, polycotton fabric with rows showing the emergency services in action. The Fire Engine rescuing the cat from a treetop, the policeman apprehending a mask clad robber and an ambulance, with medic, tending to a young skateboarding accident. Each panel is filled with cats of all sizes and shapes either sitting basking in the sunlight or leaping and jumping amongst pretty flowers and chasing butterflies. The tie backs are pale blue with delicate pink love hearts and spots. 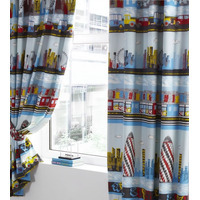 Bright and colourful, from the Inner City range of bed linen, which features images of famous London Landmarks. Including the London Eye and the Gerkin. With graffiti style writing in red, blue and yellow, skyscrapers overlooking the River Thames and tube trains passing through the Underground stations. Peppas wearing her heart shaped sunglasses as its very sunny on the beach today, and she has so much to do, before she can rest in one of the cute beach huts. Theres the red crab to catch and the blue starfish to rescue, besides the sand castles which need building, and the sea which requires a paddle. 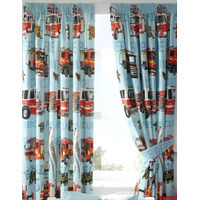 Boys, fully lined bedroom curtains with a Fire Engine Theme. 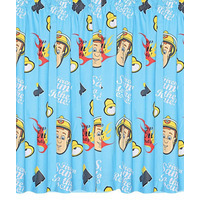 This easy care fabric has a pale blue background with rows of red fire engines and trucks manned by the fire fighters in their regulation black uniforms and their emergency outfits. The pattern is interspersed with a deeper blue lettering - FIRE RESCUE, FIRE DEPT 999 and ENGINE 5. The set includes tie backs. The Teenage Mutant Ninja Turtles are bursting into kids bedrooms all over the place. 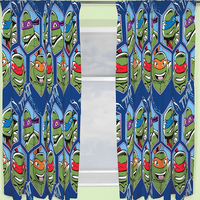 These pencil pleat curtains have all four of the turtles, Raph, Donnie, Leo and Mikey all over them in a rotary style. BMX City for those young dudes with BMX Bikes, spending their days at the BMX Skate Parks. 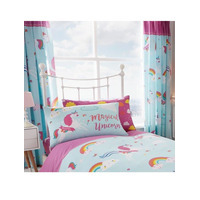 If you are decorating your child’s room then you will want to come up with an appropriate theme before embarking on your shopping mission for kids curtains and a range of other matching children’s bedroom accessories. It is important that the children’s curtains in the bedroom match the room and its theme and make the room look well put together. Children feel the need to express themselves and they can do that through their bedroom and the things that are inside. Their bedroom is perfect for that because it can be a complete reflection of themselves. 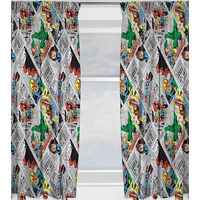 Here are some kids curtains themed around popular characters. Children’s curtains basically mean themed curtains. Characters like Winnie the Pooh, Thomas The Tank Engine, Peppa Pig, Disney etc are quite popular in the UK. 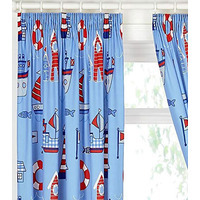 Apart from character themed curtains, children also seem to be fond of football curtains and popular teams in the UK including Manchester United, Chelsea, Arsenal etc. You would, therefore, find that there are countless options available for you to meet your children’s bedroom decor needs. Curtains are in basically every child’s room. They are crucial if there are windows. Kids all have vastly different personalities, likes, tastes, and dislikes so it is important to pick curtains for children’s bedrooms that reflect who they are and help them to express themselves. The main purpose of curtains is to keep light from coming into the room and to give the child privacy but they can be for so much more such as decoration. It is important that the curtains in the children’s bedroom match the room and its theme and make the room look well put together. Children feel the need to express themselves and they can do that through their bedroom and the things that are inside. Their bedroom is perfect for that because it can be a complete reflection of themselves. 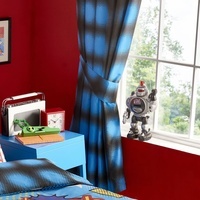 There are a few key factors to keep in mind when choosing curtains for your kid’s bedroom. First of all, style is obviously the most important. If your child doesn’t like the curtains then they won’t enjoy the way their room looks as much as if they did like the curtains. 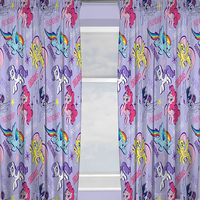 Discuss with your child what they want the curtains in their room to look like. They may have no idea so going shopping with them or looking up different designs on the internet may also be a good idea. First, look at what the theme of their room is. 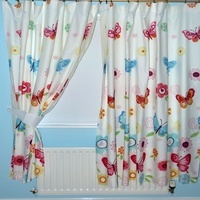 If they have no specific theme then any design or style of the curtain will the work fine if your child likes it. Choosing a curtain that is a solid color is a great idea if you don’t want to buy your child new curtains once a year or even once every few years. Children’s tastes and personality change a lot in their young years so it is important to consider that when purchasing curtains for their bedroom. 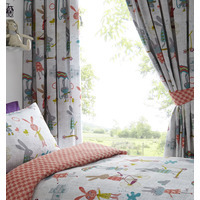 Matching your child’s bedroom theme to the style or design of curtains isn’t a difficult task at all. 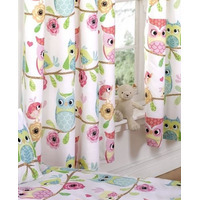 There are hundreds upon hundreds of curtain designs for children for you to choose from. 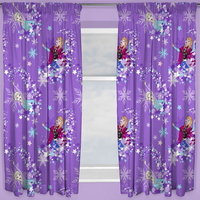 So if your daughter has a princess themed room then you could buy her curtains with Disney princesses or a castle on them. For babies, there is always the regular pink for girls and blue for boys or whichever color fits your family and the room best. 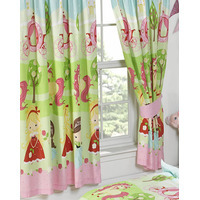 If your child has a favorite color then that could possibly be a good color for her curtains. There are some specifications that are also important to remember. The curtains need to fit the windows in the child’s bedroom exactly. You can measure the windows yourself or have someone else do it. The packaging on the curtains will say the specific measurements. It is crucial that the measurements of the curtains match the measurements of the windows because otherwise it won’t look right or the curtains won’t fit properly. When you finally purchase curtains of your choice then it is very important that you read the instructions and directions carefully before putting them on your window. This is because you want them to look good and fit how they are supposed to. Make sure you buy the right type of curtain for the window so that it looks right. There are a few more specifications to consider. 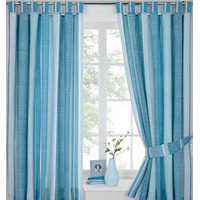 Since young child often spills things or make messes the durability of the curtains is important. If they will last a long time and are not easily torn then they might be a better buy than a cheap flimsy one. 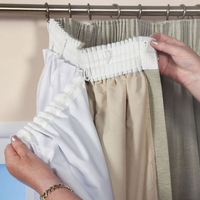 Curtains that can be used in the washing machine are also great for kid’s bedrooms. Whenever there is a spill or a mess then they can just be washed and can be good as new instead of having to purchase a new one. Certain curtains block out light better than others. If your child needs a nightlight at night then curtains that let in a little bit of light would be perfect and if your child needs it to be pitch black at night then blackout curtains could possibly work best. There are other things like material, color, texture, and durability that are important to consider when buying curtains for your child’s bedroom. Next of course is the purchasing of the curtains. 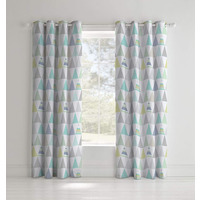 Many different stores carry children’s curtains but there are specific kinds of stores that do. Stores with home decoration such as IKEA, ASDA, Next, Tesco, Dunelm, Amazon etc carry an assortment of children’s curtains. Also, stores that specialize in children’s bedroom decorations are a good place to look. The downside to these kinds of stores is that they only have a certain selection of curtains. This may be fine for your child but if they are picky or you have something specific in mind then looking elsewhere might be a better option. Shopping online always works because there are thousands of options only a click away. Another benefit to online shopping is that it is easy for your child to shop with you. Sometimes it can be hard to shop for things at stores with kids along but sitting with your child with a computer in front of you is very easy. 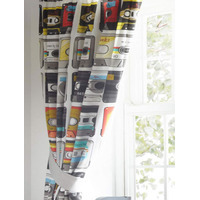 There are hundreds of websites with curtains that your child may like. You can start by using your search engine and looking up children’s curtains or you may already have a specific website in mind. You can also look up something specific such as princess curtains. Children love to personalize their things and feel grown up and letting them pick out their own curtains is a fantastic and easy way to let them do that. 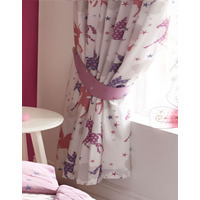 There are different styles and specifications to consider when making a purchase of children’s curtains. It is important to match the curtains to the child’s room and figure out how you can best improve their sleep with the curtains. Purchasing them online is a great way to do this because you can easily shop with or even without your child. No matter what your purchase is, it will personalize and improve your child’s room and happiness.